Survey results for Canberra’s light rail network shoe more than 70 per cent of respondents will use the new network for their commute to work. 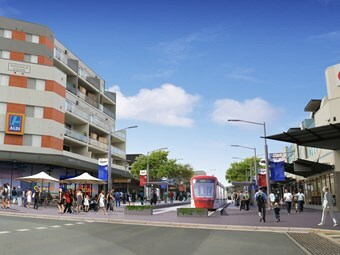 The independent survey results were released by the Gungahlin Community Council demonstrating high levels of support for the first stage of Canberra’s light rail network. More than 70 per cent of respondents to this independent survey have indicated they would use light rail for their commute to work. Survey results show 90 per cent of Gungahlin commuters into the city and the north side use their car. ACT Minister for Capital Metro Simon Corbell says with increasing traffic congestion and travel times from Gungahlin to the city, survey respondents see light rail as the solution, not only to their slow commute, but also to help improve the bus system, resolve parking issues and general traffic conditions within the town centre. "These results demonstrate the need for light rail in the ACT to provide an improved and integrated, high quality, frequent and reliable public transport system that benefits the community; helping to ease congestion and take pressure off the road network," he says. "I’d like to thank Gungahlin Community Council for taking the initiative to undertake this research to gather the views of residents on a range of important topics for the region. "The ACT Government appreciates the ongoing work carried out by the council on behalf of their community. " The Gungahlin Community Council’s survey results are invaluable to the ACT Government in addition to the feedback received as part of recent Capital Metro consultation programs. The ACT community provided feedback on the latest design thinking for the project including landscaping, stop designs, walking and cycling options, as well as the overall design vision for the light rail corridor. "The consultation provided a great opportunity for people to let us know if we are on the right track with the urban design guidelines and to share their views with us before the project goes to detailed tender," Corbell says. "The response to the consultation was really encouraging with hundreds of people coming out to meet with the Capital Metro team at face-to-face consultation sessions. "Our interactive consultation website was also a success with more than 5,000 visitors. Further opportunities to provide feedback on elements of the project will be available later this year." More than 1,300 Gungahlin residents completed the survey undertaken by Gungahlin Community Council.